First, of course, this is not an actual Asian recipe – all the usual disclaimers about being authentic to Anne’s Kitchen and New York City 21st Century Fusion. It’s also not a real stir fry, though it borrows heavily from that technique. I got an idea, though, and decided I wanted to try it. I had half a large carrot I wanted to finish, and I’d gotten a new stem of ginger (having run out) and those scallions are much too big and, well, oniony for salad, and… this started forming itself in my mind… Last year, I seared them in a pan with bacon – perhaps a variation of that? Then I scrubbed the carrot and trimmed it, and cut it in small pieces. (And will cut it in smaller pieces, the next time I do this – these ended up a little harder than I wanted.) And I cleaned and trimmed a large scallion, cut the white part in sections, and the green ends in longer pieces which I put with the reserved sprout leaves. I also took the new stem of ginger, peeled the end, and used my handy dandy ginger grater to grate – oh, about half an inch? from the end. Now, if you don’t have a fancy Japanese grater (I’m still surprised that I do, it was a gift) you can use the pierced side of a box grater, or just slice and mince. I did that until very recently, and it works fine. I used my cast iron skillet, and heated it, then added oil. I added the ginger to the oil and stirred it around to mix – the idea is to then be able to distribute it thoroughly through the vegetables. Then I added the quartered Brussels sprouts, the carrot, and the white part of the scallion (still reserving all the loose cut leaves) and stirred it all well to coat with the ginger flavored oil. I lowered the heat to medium, and let it all cook about five minutes, stirring every minute or so. We liked it. The seasoning was very subtle – might not have consciously noticed it if I hadn’t known it was there, but it did add a grace note. 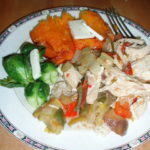 The whole thing became more a central dish than a side dish – I served it with plain rice and poached chicken, and that felt right. 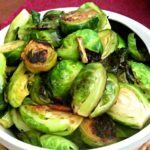 Asian Inspired Brussels Sprouts - Crisp vegetables with a subtle seasoning elevate this classic Fall vegetable to the center of a meal. 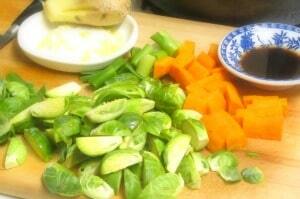 Wash and trim Brussels sprouts, and cut in quarters, reserving loose leaves. Scrub carrot, and cut in inch long pieces, then cut them in thin sticks. Trim scallion, cut in sections, reserving the green leaves with the loose sprout leaves. Grate or mince about half an inch of ginger root. Mix vinegar and soy sauce in small bowl. Heat a heavy pan until hot, add the oil and heat it. Add ginger, and stir to blend. 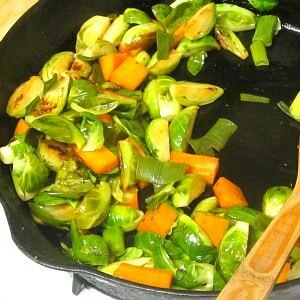 Add quartered sprouts, carrots, and the white parts of the scallion, and stir to coat with seasoned oil. Let cook 5 minutes, stirring frequently. Add the leafy parts of the sprouts and scallions. Add the vinegar soy mixture, and cover. Cook another 3-5 minutes, until sprouts are done to taste. WIAW 136 – More Vegetables! 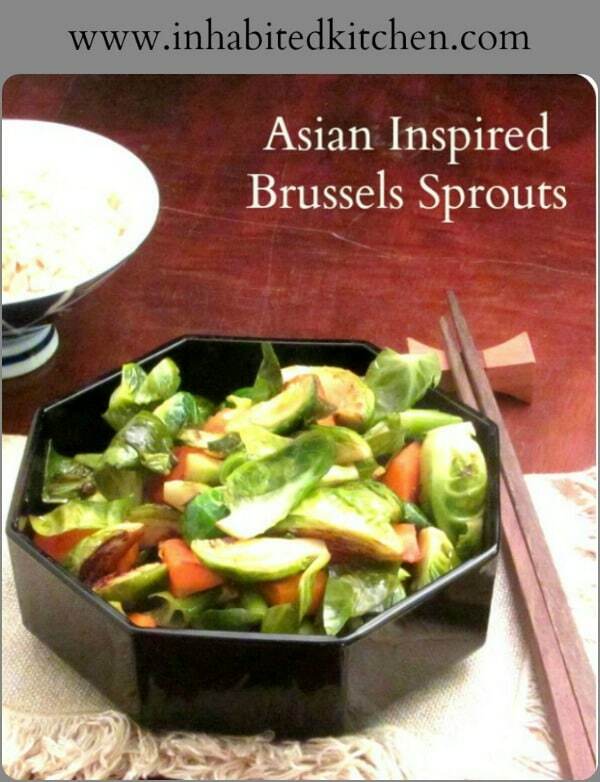 We love Brussels Sprouts and I've never made them with an Asian flair before. I'm going to use your recipe on my next batch! Thank you! We love them too, but it was nice to do something just a little different with them. I love Brussels sprouts! Love all the flavor you've got going on here! Yum! Thanks! We liked having a flavor that set them off, but didn't interfere with their own wonderful taste. 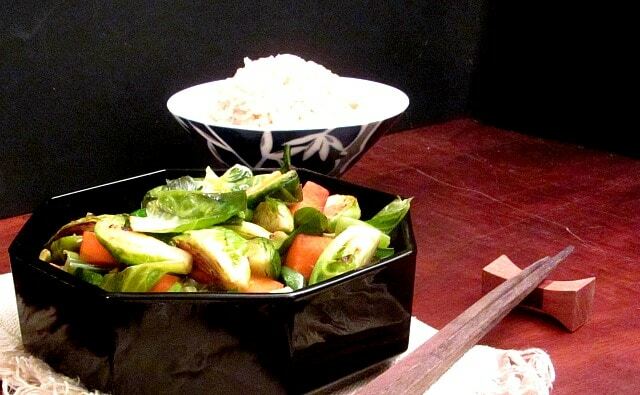 What a creative brussel sprout recipe :) I can't wait to try it. Thank you! I hope you enjoy them as much as we did! 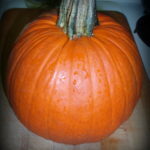 World's most misunderstood and underrated vegetable. 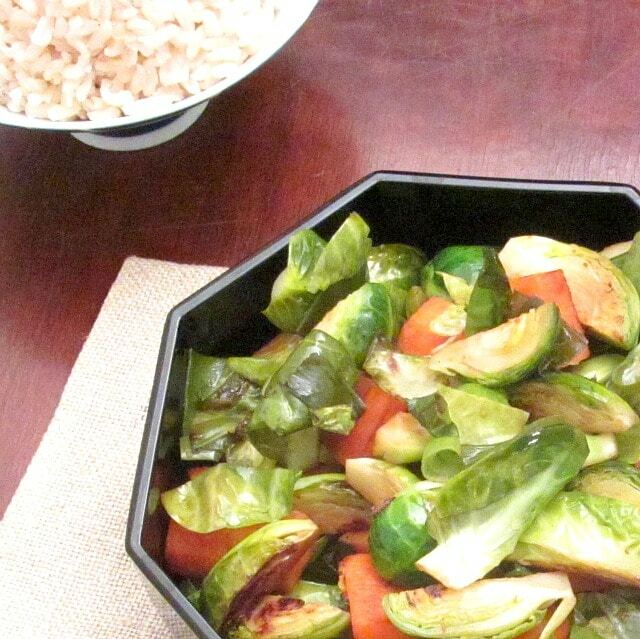 I love Brussel sprouts and this looks great. Well, like all the the cole crops they're pretty awful when they're overcooked. So I'd add mishandled to your list... They're hard, so people boil them to death, thinking to tenderize them, but instead of being tender they get slimy and sulpherous. I go for tender-crisp and delicious! And I've been delighted that more and more people seem to understand that. My family love Brussel sprouts. This is a very interesting twist on more traditional receipts for these flavour packed vegetables. I look forward to trying this single, honest, wholesome recipe. Love the flavor twist. Love the ginger! Thank you! It worked well, I thought. I love Brussel sprouts!! Usually, I make it with bacon and rice vinegar but I never used fresh ginger and I love fresh ginger!! I hadn't used this combination before either - but I'm glad I did! I love brussel sprouts! :D I don't like them steamed though, but stir-fried?? Yes please!! Love the asian flavours here too. Thank you! I do like steamed - as long as they're not overcooked... But this is a nice change, crisper. Enjoy them! 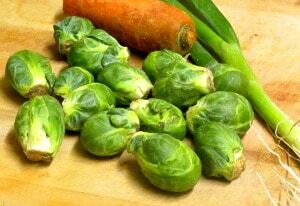 I love Brussels sprouts! And I think they pair so beautifully with Asian flavors like this. This preparation sounds great!